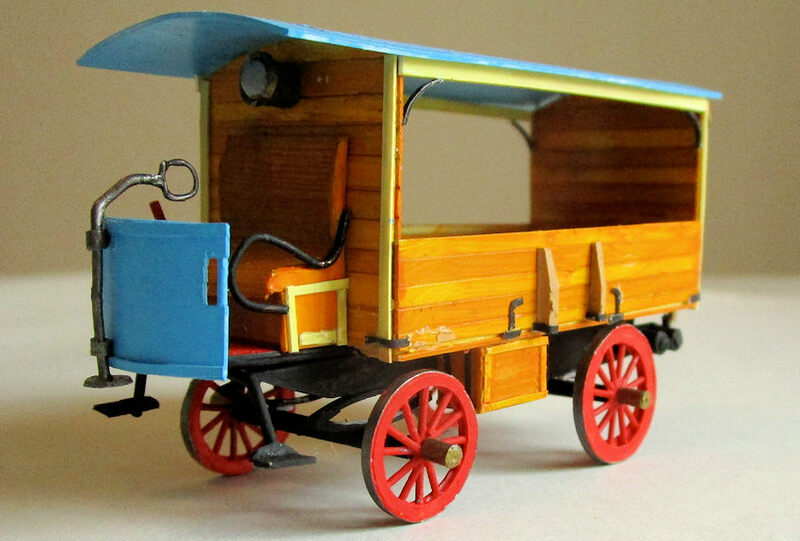 This First Truck was manufactured in 1899 by Nesselsdorfer Wagenbau-Fabriks-Gesellschaft or NW, which slightly later became the firm we now know as Tatra. It wasn't quite the first truck ever built, that title goes to Benz a little earlier in 1895, but it was the first Tatra and is thus the original ancestor of the huge number of commercial vehicles, trucks, trams, railway engines, fire engines, ambulances and also cars which Tatra continues to make down to this day. So it has quite a legacy. It had two flat twin liquid cooled Benz engines under the rear end, and the unique feature of this setup was that the two engines could be operated sequentially depending on the load. The first engine was started by crank handle and had a flywheel attached. The second engine was connected via a clutch and could be started from the running engine. The second engine could also be switched off while driving, which cut fuel consumption by half. Both engines used vapour cooling, coolant fumes being led to the roof condenser and recycled back into the coolant tanks, which look rather like two milk churns at the rear. After the company had made its first passenger car, the President, it focused on manufacturing this first truck, and so began a long tradition. As you can see, the truck was a flatbed with a roof over the driver's area, which could seat two. It had two and a half ton capacity, and the rear wall middle section could be hinged down to form a loading ramp. An iron frame had two sets of elliptical leaf springs for the front axle. The rear axle was mounted on two sets of coil springs. The wooden artillery wheels have steel rims. The steering tiller is on the right in front of the driver. It could reach a daring 12 and a half mph, or rather less than half of Usein Bolt's top speed. It was able to climb 12 degree angle slope. Fortunately there are excellent photos of this machine on the internet, and it is easy to draw up plans and rough sketches from these. The first question was what scale to employ. The normal scale for a machine like this would be 1/32 or 1/24 in plastic, or possibly 1/43 to match die-cast models. But since I make aircraft in the gentleman's scale of 1/72, then I thought that would be suitable for the truck to rest on the aircraft shelf. I don't make dioramas, but one could easily imagine it alongside an early European aircraft, perhaps bringing it fuel. I began with the wheels, since these looked to be the only difficult part of the build. The rims were formed from card using a circle cutter, which is an invaluable tool, which I found in a local artist's store. The wooden spokes are thin rod, and the tires were narrow strips of card painted gunmetal. Once they were done, the rest of the build was largely a matter of cutting rectangles. The flatbed, sides and ends of the carrying area were all scored lengthwise, masked, and painted different shades of light brown to represent the planking. They all got a coat of clear orange. Likewise the driver's seat box, and forward floor. The seat was a section of card, folded into curves, with horizontal planking. The arm rests are bent wire. The steering tiller is also bent wire, with a thin solder handle. It has short lengths of plastic tube to locate it. And the front dash is curved, with cut-outs for the hand grips, which are rod. A couple of little steps up to the cab are made from rod and card. A brake lever and its quadrant are flat section card, with a red painted rod for the handle. And the single headlight is made from some old thick sprue with a card wraparound, painted brass and silver and is mounted above the driver's head. The clear lens is a few drops of Humbrol Clearfix, although wood glue would work. 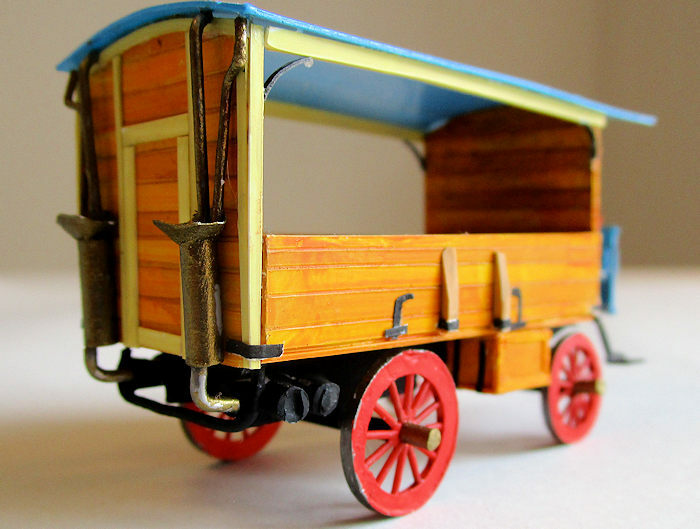 The body rests on a simple oblong frame, and the two flat twin engines, made from sprue and thick card are fixed under the rear, with odd bits of wire and tubing. The two cooling vapour collectors are thick sprue with some paper conical tops. Note that the top cones are flattened where they are squashed up against the rear wall. I suspect they are only very thin metal on the original. And the plumbing up to the roof surface radiator is copper wire. The roof is a curved oblong of card, with some scoring round the edge. I followed the rather nice colour scheme of the replica in the museum and painted it a sky blue, though I dare say any colour will do, since no original First Truck exists to betray you. The rear tilting loading ramp was delineated using a light buff coloured frame. A couple of locking chocks on each of the folding sides were made from wedges of thick card. Then some iron strapping was run up from thin strips of paper, painted matt black and applied here and there, all over the place, as hinges and strengthening brackets at the corners. There are a couple of boxes hanging under each side, which I suspect might have been tool boxes. Although a spare wheel wouldn't have been necessary since there were no pneumatic tires and hence no punctures. The ride over cobbled streets must have been tooth-shattering. Finally the wheel hubs were made from end-cuts of rod, and painted brass. 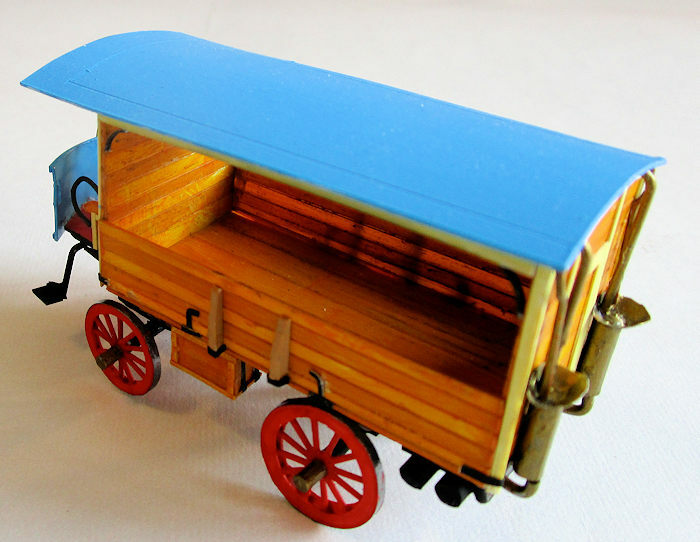 There you have an easy scratch build which leaves you with a delightful little commercial vehicle. Not quite the first truck ever, but very close, and a worthy ancestor to the Tatra 813, one of the best designed and most ubiquitous trucks of all time, with its single tube chassis and optional 4x4, 6x6 or 8x8 layouts; and to the Tatra 815, which these days dominate the truck section of the Dakar Rallies.